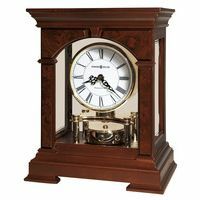 The Hermle Shelbourne Grandfather Clock is handcrafted with a case made of solid mahogany and veneer and finished in a distressed Wilton walnut. The case is complimented with a beautiful shell crown ornament that decorates the cascading bonnet crown, heavily hand-carved column caps and deeply fluted columns. A bombe-shaped 4-tiered base with hand carved feet and floor levelers complete this well balanced case. Case also features beveled glass on the front waist door and side panels, and includes a lockable waist door. 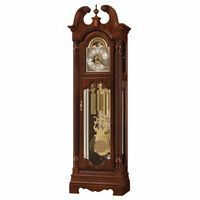 The matching set of antique accessories includes a dial with applied brass Arabic numerals, a rotating moon disk and an ornate cast center and corner spandrels. The pendulum shells have a matching band. 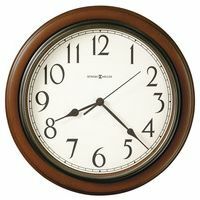 The Hermle German-made mechanical 8 day cable driven movement offers the three most renowned clock melodies, including Westminster Chimes, St. Michaels and Whittington Chime. Second hand feature and automatic night shut-off. Made in Germany.